One of my favorite treats is Soft Pretzels. I remember as a little girl my parents would take us kids to Solvang, California. It was a little Danish Town that we loved to visit. I don't remember to much about it because it was so long ago (back in the early 70's). I can still picture the windmills in my head and their wonderful soft pretzels. They were simply the best! I couldn't wait to get my hands on one of the soft pretzels with cheese and just walk around with my brothers and sister and eat those pretzels. What a great childhood memory. I guess that is where I learned to love pretzels so much. Well my kids love them to, especially the Auntie Anne's Pretzels. They are my daughters absolute favorite. She loves to get the cinnamon sugar sticks and Carson likes the pretzel dogs. Isn't it funny how things just pass on in families. I wanted to try my hand at recreating one of my favorite treats. So off I went hunting and searching for a good recipe. Well I came across a Copy Cat Recipe for Auntie Anne’s Pretzels. I really wanted to try this recipe to see if they came at all close to the real deal. I do have to say one thing, this was the most challenging recipe I have ever tried to make. Making the dough was a snap, but trying to roll the dough into a rope was very time consuming. Shaping the pretzels was pretty easy, but picking them back up and getting them into the baking soda bath was really tricky. Then getting them back out in the same shape was another story. Whew it wore me out and was a lot more difficult than I initially thought it would be. I ended up doing some in the shapes of sticks because I kept messing up trying to keep the pretzel shape. In the end the pretzels tasted really good, we brushed some melted butter on the pretzels and sprinkled coarse salt on some and a cinnamon sugar mixture on the others. In the end my daughter Mackenzie said the pretzels were really really good. I thought they tasted just like a soft pretzel, but not exact to Auntie Anne's. So I guess I am still on my quest of finding a Auntie Anne's clone recipe. Next time I will be making mini pretzels or just pretzel sticks I think it will be so much easier. Do you have a favorite treat that brings back a great childhood memory? I would love to hear all about it. use your hands to form dough into a ball. Knead the dough for 5 minutes on a lightly floured surface. (Dough will be nice and smooth when ready). Place the dough into a lightly oiled bowl, cover it, store in a warm place for about 45 minutes or until dough rises to double in size. Pick up both ends of the dough and give it a little spin so the middle of the dough spins around once. Lay the dough down with the loop nearest to you. Fold the ends down toward you and pinch to attach them to the bottom of the loop. The twist should be in the middle. See diagram below. 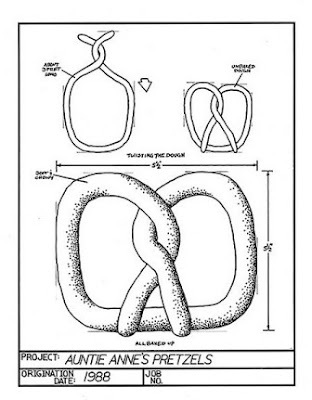 This is the diagram I used to shape the pretzels. (Very Helpful). Photo credit Google & Auntie Annes. Holding the pinched ends, dip each pretzel into the bath solution. Put each pretzel on a paper towel for a moment to blot the excess liquid. Arrange the pretzels on a baking sheet sprayed with non-stick spray. If you want salt, sprinkle pretzels with kosher salt or pretzel salt. DON'T salt any pretzels you plan to coat with cinnamon sugar. You will likely have to use two baking sheets and bake them separately. Bake the pretzels for 4 minutes and then spin the pan around and bake for another 4-5 minutes or until the pretzels are golden brown. Remove the pretzels from the oven and let them cool for a couple of minutes. If you want to eat some now, brush them with melted butter first before serving. Very pretty and very yummy. The pretzels are best if eaten the same day. Dissolve the yeast in the warm water in bread machine loaf pan. Let sit for a few minutes. Combine flour, powdered sugar and salt in a large mixing bowl. Add to water with yeast. Add vegetable oil. Set bread machine to dough setting and do something else. 20 minutes before dough cycle is complete, preheat oven to 425 degrees. Make a bath for the pretzels by combining the baking soda with the warm water and stir until baking soda is mostly dissolved. Remove the dough from bread pan and let set 15 minutes. Divide it into 8 even portions. Roll each portion on a flat non-floured surface until it is about 3 ft long. Pick up both ends of the dough and give it a little spin so the middle of the dough spins around once. Lay the dough down with the loop nearest to you. Fold the ends down toward you and pinch to attach them to the bottom of the loop. The twist should be in the middle. Holding the pinched ends, dip each pretzel into the bath solution. Put each pretzel on a paper towel for a moment to blot the excess liquid. Arrange the pretzels on a baking sheet sprayed with non-stick spray. If you want salt, sprinkle pretzels with kosher salt or pretzel salt. DON'T salt any pretzels you plan to coat with cinnamon sugar. You will likely have to use two baking sheets and bake them separately. Bake the pretzels for 3 minutes and then spin the pan around and bake for another 3-4 minutes or until the pretzels are golden brown. Remove the pretzels from the oven and let them cool for a couple of minutes. If you want to eat some with melted butter first before serving. For the cinnamon sugar coating, combine 1/2 cup sugar and 2 teaspoons cinnamon in a small bowl. Brush the unsalted pretzels with melted butter. Sprinkle a heavy coating of the cinnamon sugar on the pretzels over a large plate. Makes 8 pretzels. Pretzels taste best if eaten the same day. Dissolve the yeast in the warm water, let sit for a few minutes. Combine flour, powdered sugar and salt in a large mixing bowl. Add to water with yeast then add vegetable oil. Mix the ingriedient with a wooden spoon until it is well combined. Using your hands to form dough into a ball. Knead the dough for 5 minutes on a lightly floured surface. (Dough will be nice and smooth when ready). Place the dough into a lightly oiled bowl, cover it, store in a warm place for about 45 minutes or until dough rises to double in size. Divide it into 8 even portions. Roll each portion on a flat non-floured surface until it is about 3 ft long. Pick up both ends of the dough and give it a little spin so the middle of the dough spins around once. Lay the dough down with the loop nearest to you. Fold the ends down toward you and pinch to attach them to the bottom of the loop. The twist should be in the middle. Continue with the remaining directions of the recipe for the baking soda bath then bake. I have been wanting to make these for a while now... maybe this weekend. Growing up my brothers and enjoyed eating double chocolate chip cookies! We didn't get them very often, but my parents would sometimes take us to a little shop across the street from where we live and get us one. Good days! these look amazing. i wish i had memories of these from when I was a kid. Your pretzels look great. I can't wait to try them.My favorite childhood snack is Mike & Ike candies. I still get them whenever we go to the movies! That wore me out too just readin' it LOL!! Seriously though, I love Auntie Anne's too. Really, any hot bread of any kind, but her pretzels are very good. Yours look lovely and I'll bet they were good even if they weren't an exact copycat. Try rolling the dough with your palms. It works to make a "rope"
All your hard work paid off... they look great. I never would have guessed that homemade pretzels would be such a pain to make. I'm glad that although they didn't taste exactly like Auntie Anne's that at least they were good after all that hard work. Lara I didn't think they were that much work either. The dough was easy. But it was rolling and keeping the shape in and out of the water bath. That was the most difficult. Carol, I was using my palms to roll the ropes. The elasticity of the dough kept making it go from a long rope to a small one again. It was hard to keep the long rope shape it would spring right back. This was so fun to read. I love those kinds of experiences, especially when you get to share them with your kids years later! Yum those look excellent, thanks for sharing. I just love your blog, so I left you an award on mine! I love pretzels - I could eat one everyday! I love Solvang... we went there on our Honeymoon trip... love that place! Its a very yummy and a very delicious pretzels. I hope that you will post more and thank you for sharing. Anonymous, How neat to spend some time in Solvang Honeymooning. I wish i could go back one day it would be so fun to take my children. Koekkener, your welcome and I am so glad you liked them. I did to just a lot of work. It was my first try at pretzels. Maybe it gets easeir. Thanks for the memories, and the wonderful recipe. Thanks for sharing! Sure is helpful to find great recipes and tips when you can no longer call Mom or Grandmother. Hope you are blessed for blessing so many others. I enjoy reading your blog and trying your recipes. I'm from Texas too and we used to go to California every summer and we would always go to Solvang. Now I live about 30 minutes away from Solvang in Lompoc. And we always go to that same shop that makes those soft pretzels. Yum. I grew up in Lompoc, California I was so young around 4 or 5 we moved when i was about 8 or 9 I think. We loved to go to Solvang. Your pretzels turned out great! We like ours topped with cheese and rebaked. Yummy! Or sliced open and spread with chilled butter. Swoon. They look so delicious, even if they were difficult to make. I've always wanted to try making my own pretzels. I'll have to save it for a day when I have lots of time and patience! They do look delicious! I love the cinnamon sugar ones, too! Soft pretzels is my favorite snack. It is also what I eat whenever I am sick. I love them. We make them at home as well. I never can get the pretzels to hold their shape though. I will have to keep trying. I came across this while searching for a recipe for Solvang pretzels. I grew up near there too, and I've never found another pretzel that quite measures up! Auntie Annie's are as close as it gets though, so I'm excited to try this out. Thanks for posting this! My memories of Solvang are the same as yours, and from the same era. I am happy to report that that shop is still there and still serving the same cheese, pretzels, fudge, and cookies that it did when we were kids.